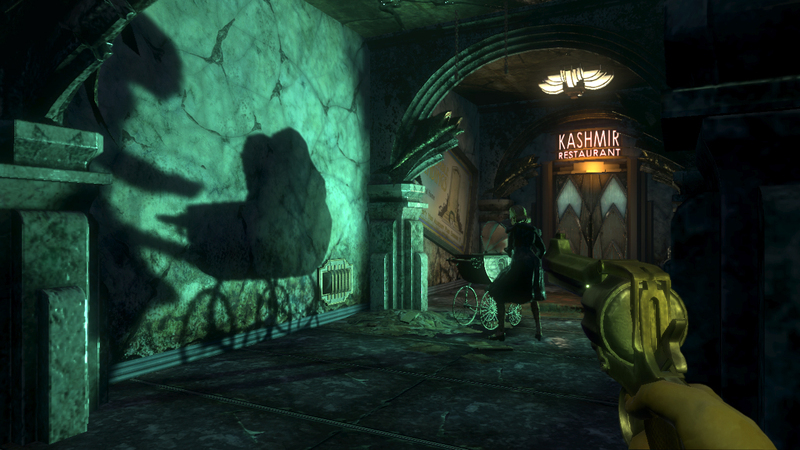 I managed to sit down for half an hour with my new copy of 2K Games' Bioshock last night, and as a thirtysomething gamer, and something of a weak-kneed clerk when it comes to scary entertainment, I was overwhelmed. 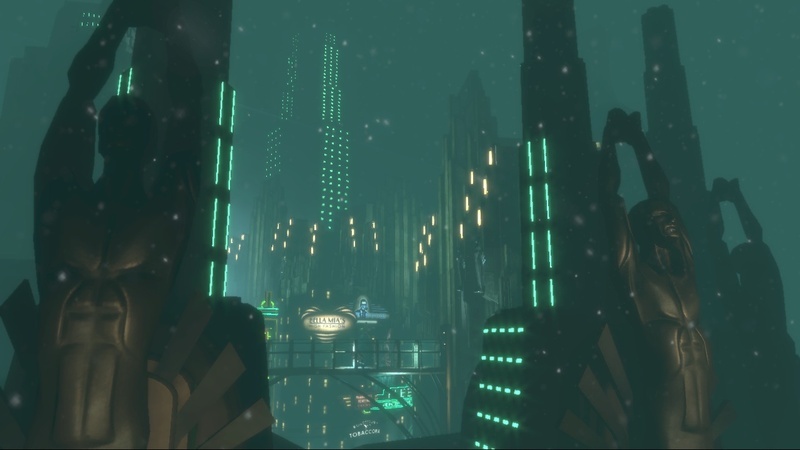 Appealing to my mania for art deco design while exploiting my total inability to think straight in a dimly lit, highly threatening environment, Bioshock is a nearly traumatizing experience. That's not to say it's no good. In fact, it's very good. The backstory alone is worth the price of admission. As anyone who's been following the gaming press knows, in the game you're the lone survivor of a plane crash, circa 1960, plunged into icy waters in the middle of the Atlantic. You're so lucky as to have crashed near an elegant lighthouse, where a submersible carries you into the depths of an undersea utopia gone wrong — Rapture. You spend the rest of the game trying to stay alive amidst the corrupting genetic technology invented by the city's founder, injecting yourself with ability-granting plasmids, rationing ammunition for the few weapons you can scrounge up, and, in my case, trying not to freak out. The place is also an homage to the romantic art and architecture of the art nouveau and art deco periods, which gives the whole place the feel of having fallen exceptionally far from its idealistic beginnings. If you were at all taken in by Myst, the 1993 game in which you explore mysterious, sumptuous worlds slowly and luxuriously (owing, in large part, to the slow processor speeds of the era's computers), you'll experience, as I did, the joy of realizing that this is just as mysterious, just as sumptuous, and yet it's all live and dynamic. It's a great feeling — You mean I can just wander up and inspect these marble staircases? — but it's immediately followed by the horrible realization that there's no time to enjoy the setting, because everyone's trying to kill you. After spending a few precious minutes reading the plaques on the wall, languidly inspecting the glasswork and savoring the undersea view, unhinged people in masks started coming out of the woodwork, and the art historian in me had to go back inside so the survivalist could take over and keep us from getting killed. I had the same reactions as you playing the demo. In front of my kid. How embarrassing. I love the game and all but i don't see how this article has to do with science. Lately popular science has been going away from science on some articles. I think they need to start focusing on science more like updating their How 2.0 which hasn't changed in the last 3 months. It is scary, but I did notice the architecture. This game is truly beautiful, in gameplay, graphics, and story. Love it.